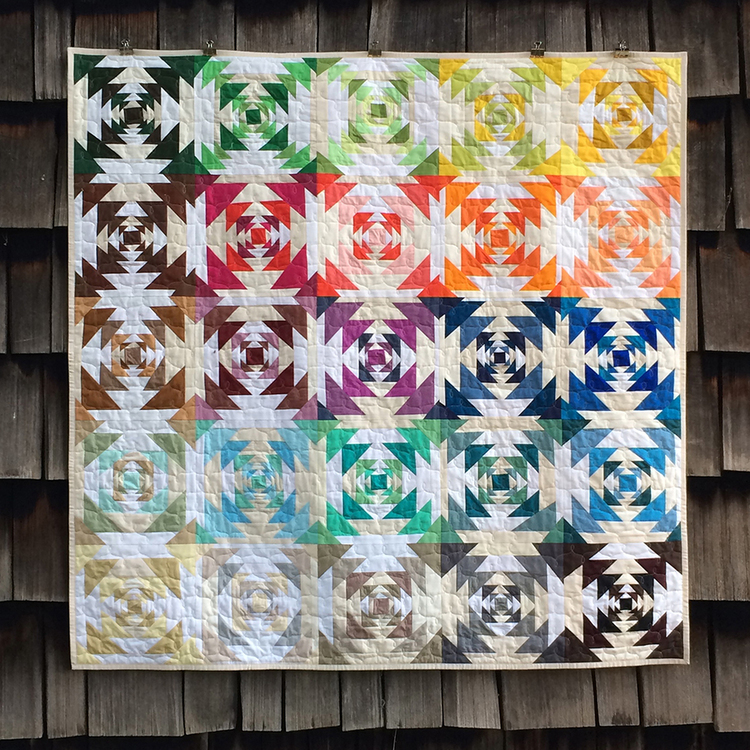 Once again the NHMQG decided to do the Charity Challenge using Robert Kaufman's Kona as our color palette. The committee decided to use shades of blue, yellow, silver and white to meet the requirements. The co-chairs met and decided to use some sort of stars in their quilt. With no real game plan on how to use these stars, they handed out packets at the meeting. 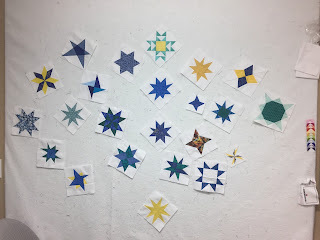 Members of their guild were to take a sample of 2 shades and complete a star or 2. They were asked make either 3” or 6” stars using the colors on their card. They could use any color from that palette the only requirement was to use the white, grey, or yellow solid as their background. Once we received the stars back we had a group sew-in with members from the guild. A game plan was established! Yellow fabric was donated from members of the guild which was cut and sewn back together to create a “scrappy looking” made fabric. 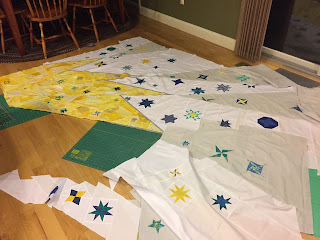 We used this made fabric to make a large scale star. 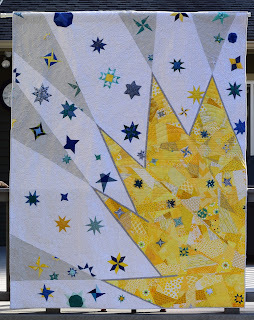 We then used a design wall to scatter the stars for placement in the large pieces of fabric to be used for the bursts. After a bit of trial and error it was determined to make non uniform star points. We started with the large star and bottom burst. We continued breaking down the quilt into large sections, working our way up and around the quilt. 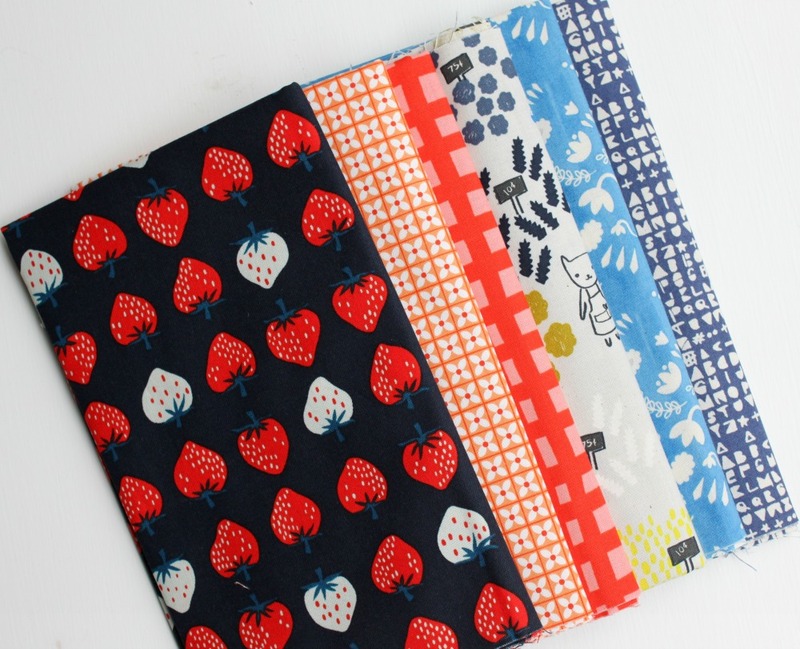 As we laid our finished quilt top on a flat surface, we found the *made fabric caused a pucker. 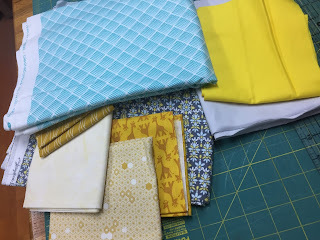 (*made fabric has an excessive amount of bias in play) After consulting our long arm quilter it was determined she could work out the excess in the quilting process. Off to the quilter it went! 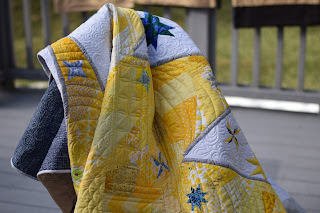 Lisa from Garden Gate Quilting, Amherst, NH worked her magic. The puckers disappeared as she used a variety of quilting designs to enhance the quilt. 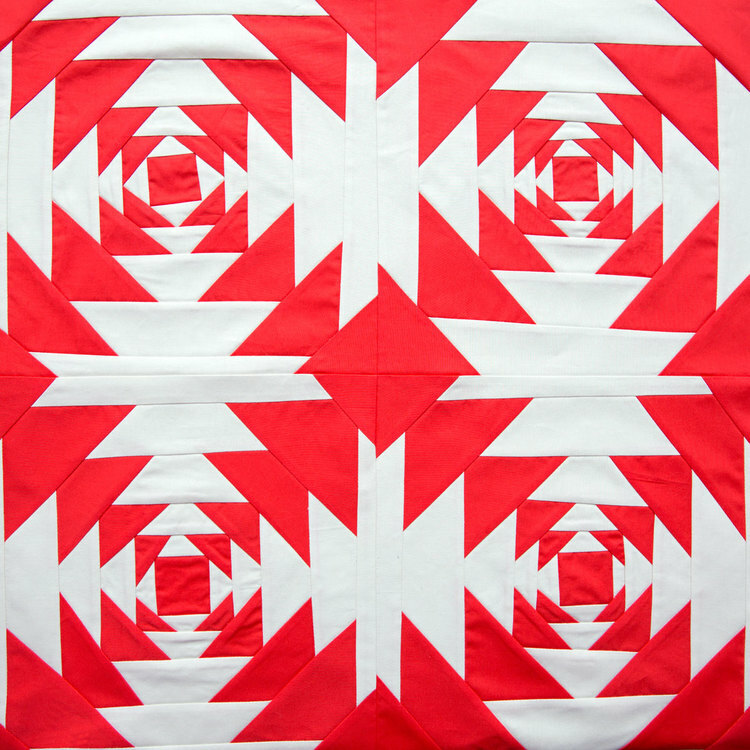 Once the quilt was returned, blocking was completed and binding added. 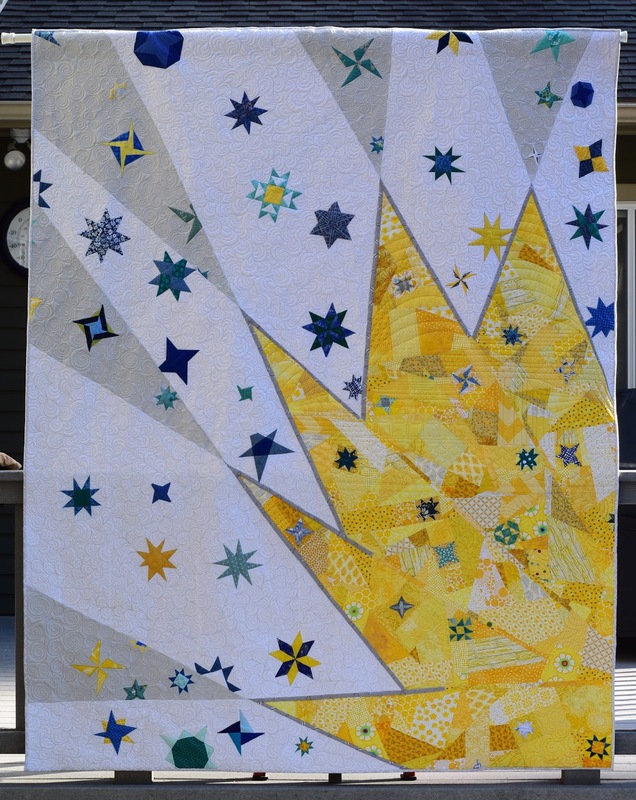 Let us present “Supernova”, NHMQG entry into Quilt Con 2017. 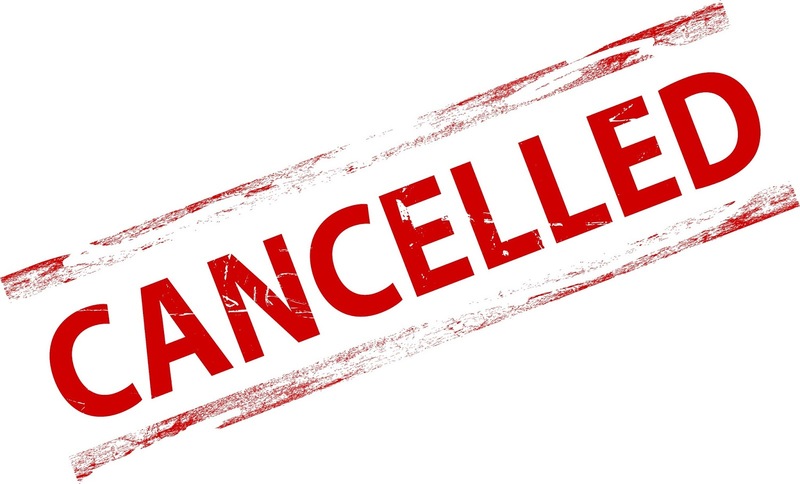 Due to the impending snow our meeting tonight will be canceled. Never fear though, all of the fun planned for tonight will be moved to the meeting on February 21st. Retreat signups were set to be tonight so please be on the lookout for additional information from us this week. Retreat is fast approaching (in March!) so signups will be happening outside of our regularly scheduled meetings. If you have a friend in the guild who may not see this email please give them a call to let them know about the cancellation. Our first meeting of 2017 will take place on Tuesday the 17th! Yard Sale: It's a New Year! 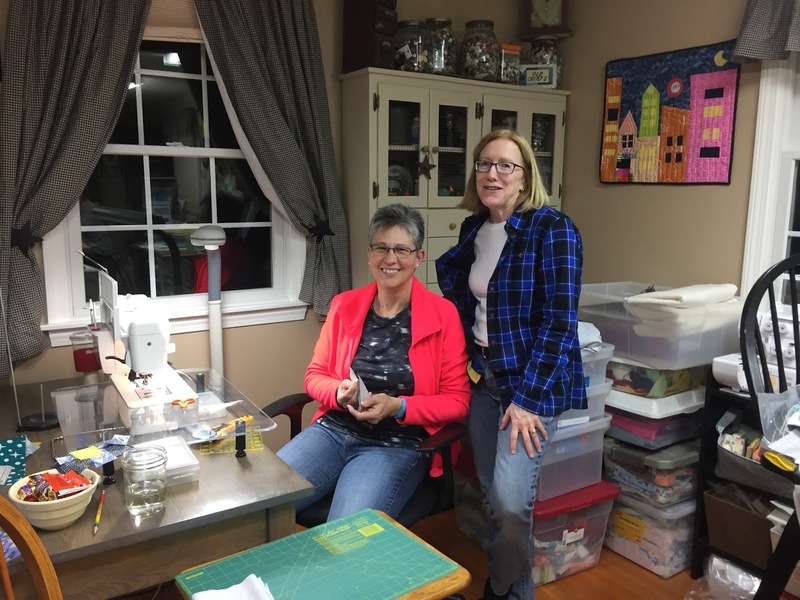 Is one of your resolutions to clean out your sewing room? You are so lucky, 'cause the NHMQG is having a Yard Sale at our January meeting!! All proceeds will be donated to the Guild to benefit Programs! Spring Retreat: Retreat signups will be held! Your room will be secured by full payment. Patty will be accepting checks, made out to NHMQG. If you can't make it to the meeting please contact Patty by January 20th. Additional retreat details can be found here. We will hold our next retreat in Kennebunk at the Franciscan Guest House on March 23-26, 2017. Registration is closed. Email Patty (pamagaw [at] comcast [dot] net) to see whether we can add more people to the event. If you plan to stay in a double room, please let Patty know who your roommate is at time of signup. 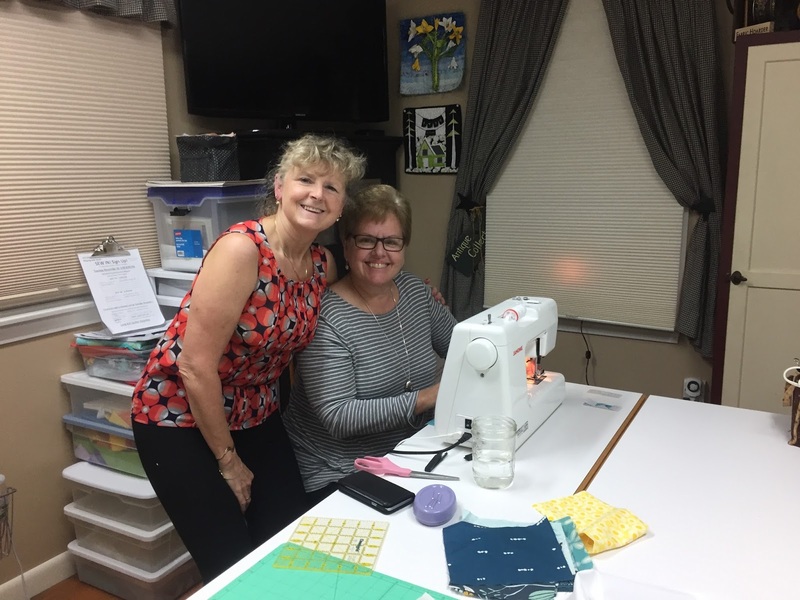 The retreat costs includes your room, breakfast each day, pizza on Saturday night and a 6 foot long table for sewing. 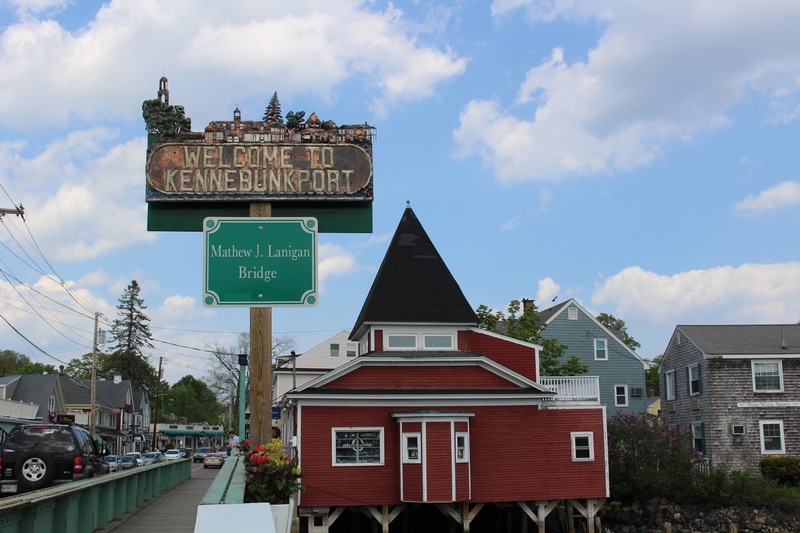 Side trips will be planned to visit Marden's and get doughnuts! We had a great time on this retreat in 2016! The sewing was great and the tacos and margaritas at Pedro's were pretty awesome too!